I cannot recall the exact moment when I resolved to meet Joe Thompson, but my email files tell me it was on or before December 4, 2017. However, I am sure of the causes for my resolution. One cause was the steps that my colleagues and I had taken toward exploring some of the earliest digital computer programs in the collection at the Computer History Museum (CHM): punched paper tapes from the 1950s used with Whirlwind, the breakthrough experimental computer created at MIT. Whirlwind I Computer, ca. 1950. Collection of the Computer History Museum, 102622503. My curiosity was heightened from lessons that I had learned, particularly from the work—and Twitter feed—of Professor Marie Hicks. From her, I had really taken in the importance of asking a set of questions to photographs and other images from the history of computing: Who is pictured? Who is not? What are the names of the people in the images? Why are some figures identified, and others not? What does the difficulty of identifying some of the figures tell us? Whirlwind with Joe Thompson. 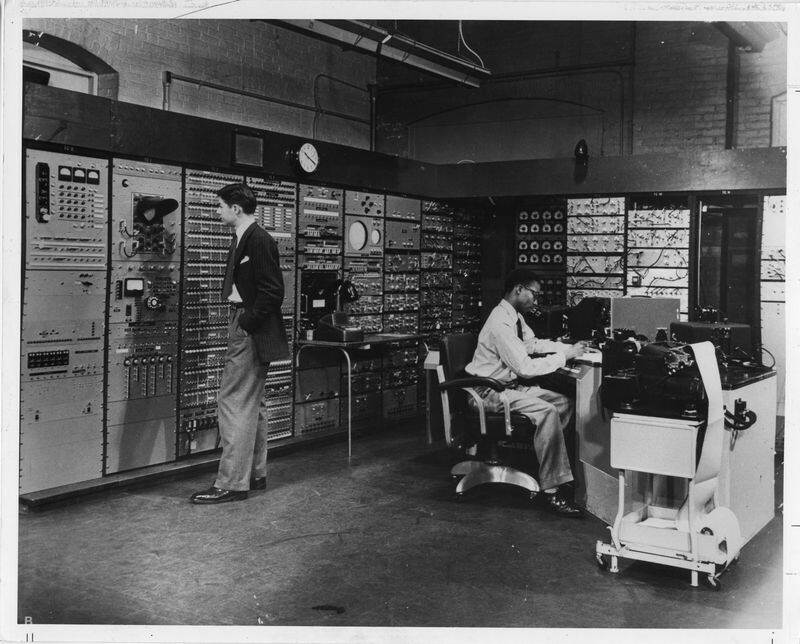 Collection of the Computer History Museum, 102622504. 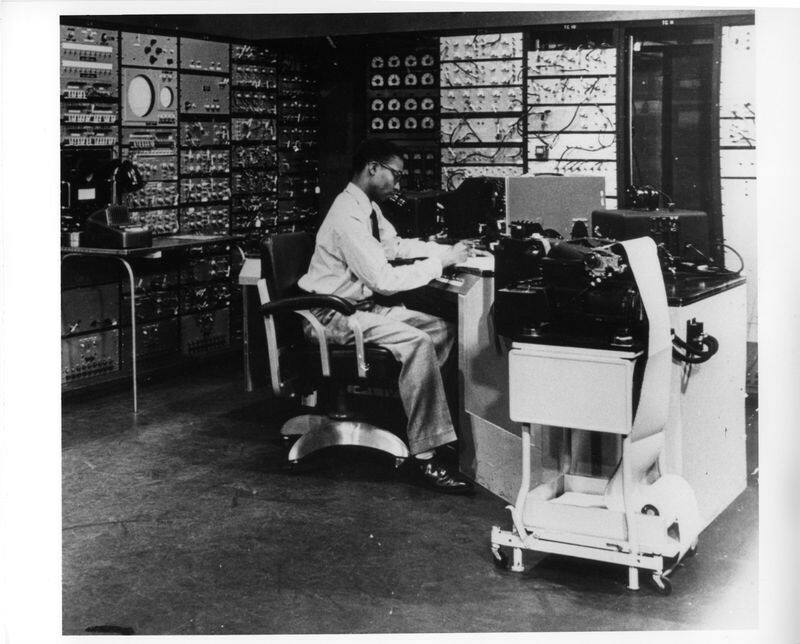 If the caption was to be believed, Joe Thompson had gone on from the remarkable experience of operating the influential Whirlwind to a further career in computing that took him to the Los Angeles Basin, a center for critical developments in the history of computing and especially so in exactly the period in which Joe Thompson had been active. I was then resolved: I would try hard to meet Joe Thompson and to conduct a filmed oral history interview with him for CHM. It had been Jack Gilmore of the Whirlwind project, famous for his software contributions, who had been key to bringing Joe Thompson into the project in an MIT push to meet the demands for skilled staff by recruiting from local high schools those students who were academically and socially exceptional, but for whom, for whatever reasons, college was inaccessible. The outlines of the story seemed to me to be becoming even more interesting and important. The first step in my resolution to meet Joe Thompson was, of course, a web search to see if I could find him. There were so many “Joseph Thompsons” in Southern California, I despaired of finding his contact information by that route. With his evident connection to the Computer History Museum in its Boston days, perhaps our files or records somehow held an address? No luck. Perhaps one of the motive forces behind the Museum’s genesis in Boston, renown computer architect Gordon Bell, might have an address? Again, no luck. It was around this time that I recalled discussions with Whirlwind software pioneer Judy Clapp and with MIT Museum historian and curator Dr. Deborah Douglas who had mentioned several reunions of people who had been involved with Whirlwind over the years. Might an address for Joe Thompson be in the records for these reunions? Did such records survive? If there was an address for Joe Thompson in them, could he still be there? I wrote to Dr. Douglas to tell her about my effort. She kindly agreed to dig through her files. Within a few days, she wrote me back with an address! Immediately, on December 20, 2017, I wrote a letter to the address with great hopes, but equal skepticism, that it would find Joe Thompson there. December turned to January. The new year began. My resolve to meet Joe Thompson receded from the center of my attention toward the back of my mind. With the letter, I had done all that I could think of doing. My resolve had become a wondering question—“What happened with that letter”—would recur seemingly randomly. On January 9, 2018—I saved the voicemail—my mobile telephone rang, as it so often does, with the caller having a number I did not recognize. By this time the plague of mobile telephone spam was within its exponential growth, so I did not answer. If the call were real, I reasoned then as I do now, the caller would leave a voicemail. The phone blipped: there was a new voicemail. I listened: “Hello, David. This is Joe Thompson . . .” A few months later, I sat down in Mr. Thompson’s living room in Carson, California, to conduct his oral history, carefully recorded by my Museum colleague Max Plutte. My story of meeting Joe Thompson, while very important to me personally, is of course of no importance in comparison to the experiences that he shared with me. A wonderful excerpt of the interview was recently published by my colleague Dag Spicer in the IEEE Annals of the History of Computing. I will indulge myself by closing this essay with a lesson that I have taken with me from my meeting and talking with Joe Thompson. Perhaps the capabilities, interests, passions, and even genius in the sense of talents of rare quality that people possess are not latent, but rather emergent. These human contributions to technology, science, art, medicine, industry, community, and care come into existence when people have an opportunity to encounter new pursuits, new situations, and new experiences. A genius for computing, for example, comes into being through the encounter of a particular person with a particular situation, with it appearing fundamentally unknowable which combination of person and situation will lead to such excellence. For me, the import of this lesson is for the deep importance of diversity and true inclusion. The potentials for excellence lie everywhere. It is only by opening and increasing the chances for combining many different people with many different experiences that the potentialities for contribution, success, and happiness can become actualities, and human talent made real. Oral History of Joe Thompson, interviewed by David C. Brock on February 19, 2018, in Carson, CA. Collection of the Computer History Museum, 102738732. Full transcript.